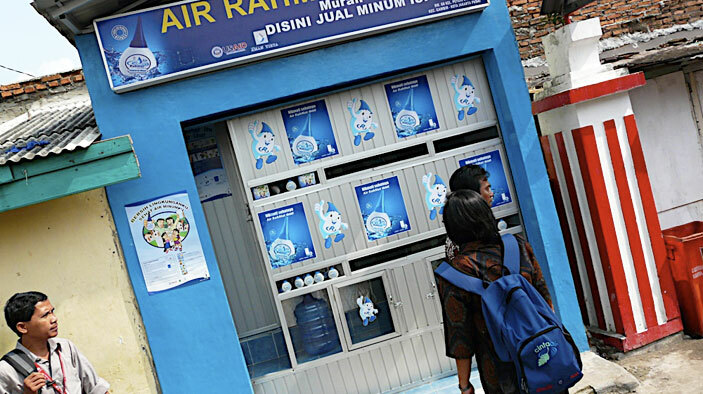 In Indonesia, 100 million people lack access to clean water, and many households in densely populated areas are not served by existing piped water. This project developed an innovative “ridge to reef” approach that leveraged the inextricable connection between health and the environment. It expanded access to clean water by protecting upland raw water sources while working with water providers and users in the lowlands to increase access to water and sanitation services. Build strong partnerships with municipal water companies to develop affordable access to piped water for low-income households. Plan and facilitate solid waste management and clean water and sanitation infrastructure. Expand access to safe water by strengthening watershed management and delivery of key environmental services such as wastewater collection and treatment. Nearly 300,000 households (1.8 million people) now have access to clean water. Developed 83 community-based solid waste management systems serving 38,000 people. Rehabilitated 52,561 hectares of degraded land. Improved local management of 214,468 hectares of high conservation-value forest. Trained 36,000 people in natural resources and biodiversity conservation, and trained 7,800 people through project field schools. Signed 22 master agreements with municipal water companies and local banks, with 12,000 households gaining access to clean water; the project leveraged $1,211,100 for these new connections. $29.9 million of resources leveraged to expand impact of ESP work.